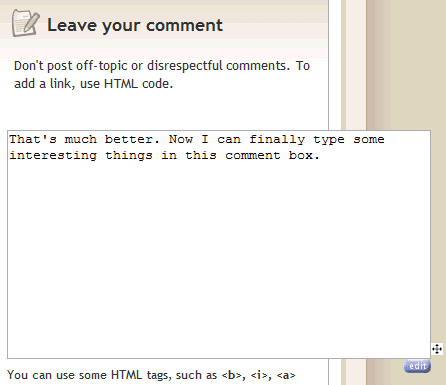 If you ever start to type a comment on a blog and you realize that the textarea is very small and it doesn't have any of the powerful features from your favorite text editor, you should try It's All Text, a Firefox extension that makes the transition between any textarea and your text editor. The extension adds a small Edit button below the textarea that copies the existing text in a temporary file and it launches Notepad or any other text editor installed on your computer. When you save the file, its content is automatically added to the textarea, so you don't have to use copy-paste. 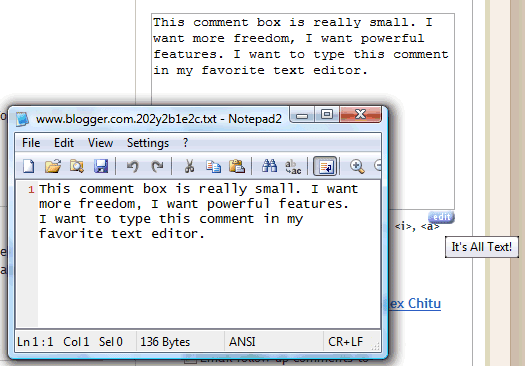 In case you don't need a text editor, but some comment boxes are way too small, this Greasemonkey script lets you resize them, by dragging a small icon. Another good option is to use the Resizeable Textarea Firefox extension. This bookmarklet should work in most browsers, but you need to click on the bookmark before resizing a textarea. Somebody suggested that every comment box should be a Google Docs-like rich text editor, but until popular blogging engines support tables and image uploading, Flickr Rich Edit adds some simple editing options for those who don't want to type HTML tags. The Greasemonkey script works only for Flickr's comment boxes by default, but you can add the options to any textarea by replacing http://*flickr.com/* with * in the list of included pages. Safari can resize any text area out of the box.